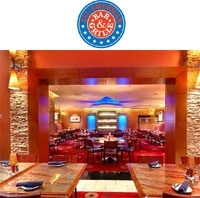 All-American Bar & Grille is a Las Vegas American restaurant located at Rio All-Suite Hotel & Casino. All-American Grille features "Rio Dry Aged" in-house famous steaks. All-American Grille also serves a variety of salads, sandwiches, seafood, Angus steaks. Steak, burgers and seafood at All-American are all prepared over a mesquite wood grill. All-American Grille offers guests a contemporary atmosphere complete with exhibition kitchen and a sports bar with 10 plasma televisions.